The relationship between God's Law and the Gospel is a major topic in Lutheran and Reformed theology. In these traditions, the distinction between the Doctrines of Law, which demands obedience to God's will, and Gospel, which promises the forgiveness of sins in light of the person and work of Jesus Christ, is critical. It is used as a hermeneutical principle of biblical interpretation and a guiding principle in homiletics (sermon composition) and pastoral care. In his Institutes of the Christian Religion, the Reformer John Calvin likewise distinguished three uses in the Law. Calvin wrote: "That the whole matter may be made clearer, let us take a succinct view of the office and use of the Moral Law. Now this office and use seems to me to consist of three parts." By "exhibiting the righteousness of God, in other words, the righteousness which alone is acceptable to God, it admonishes every one of his own unrighteousness, certiorates, convicts, and finally condemns him." It acts "by means of its fearful denunciations and the consequent dread of punishment, to curb those who, unless forced, have no regard for rectitude and justice." "The third use of the Law. . .has respect to believers in whose hearts the Spirit of God already flourishes and reigns. . . . For it is the best instrument for enabling them daily to learn with greater truth and certainty what that will of the Lord is which they aspire to follow, and to confirm them in this knowledge. . ." This scheme is the same as the Formula of Concord, with the exception that the first and second uses are transposed. Luther speaks of the Gospel as "a word of salvation, a word of grace, a word of comfort, a word of joy, a voice of the bridegroom and the bride, a good word, a word of peace," and sees it as the clear duty of every preacher to proclaim this precious Gospel. In fact, says Luther in his Explanations of the Ninety-five Theses, "May every single sermon be forever damned which persuades a person to find security and trust in or through anything whatever except the pure mercy of God, which is Christ." Luther s condemnation of many of the priests of his day was not because of immorality, but because they did not preach the Gospel and apply the means of grace which alone can bestow the fruits of Christ s atonement. 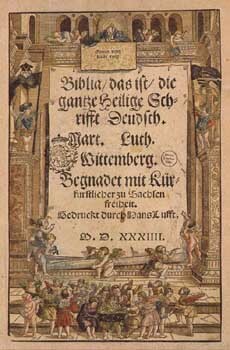 In Luther s day, certain priests were consecrated only for the purpose of offering the sacrifice of the mass. What does Luther say of such priests because they don't offer the Gospel? They do not preach. They do not baptize. They do not administer the sacrament. They do not absolve. They do not pray (except to intone badly and hiss the words of the Psalter). They do not exercise the office of the care of souls, nor do they do anything with the dying; rather, they are a useless, lazy idle crowd who alone, as they suppose handle the sacrament and sell it as a sacrifice and good work. 9As I often insist, therefore, these two, the Law and the promise, must be very carefully distinguished; for they are as far apart in time, place, and person, and all features as heaven and earth, the beginning of the world and its end. They are indeed close together, because they are joined in one [person] or in one soul. Nevertheless, in attitude and function they should be separated as far as possible, in such a way that the Law has dominion over the flesh, but the promise reigns sweetly in the conscience? (LW 26:301). our relationship with God and two to our relationship with neighbor. See LW 51:70-75. employs the law in its first use.12 Attending to what set of relationships, or arena of our existence, Luther is addressing is therefore crucial to tracking accurately his use of the law in his preaching. This figure of a written epistle is, however, in accord with Scripture usage. Ten Commandments Moses commands (Deut 6:6-9; 11, 18) that the Israelites write the Ten Commandments in all places where they walked or stood upon the posts of their houses, and upon their gates, and ever have them before their eyes and in their hearts.